Featuring four Patchwork Christmas Stockings to decorate your tree or to tie on a gift for someone special! 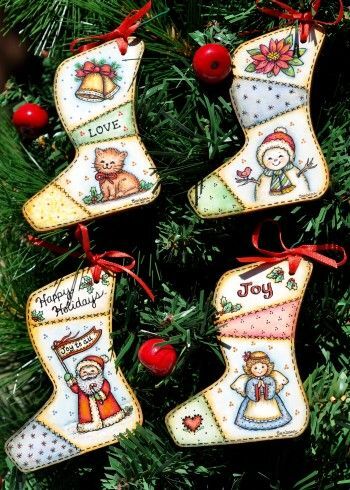 The wooden cutout stockings are available in two sizes: Small (2 3/4” x 3 1/4”) and Large (3 1/4 “ x 4”), the originals pictured were painted on the small size. Full size patterns for both sizes are included in the packet. This packet contains: Complete directions, four color photos and two full size pattern pages.